Earn $6.95 in VIP credit (695 points)What's This? With its Downhill pedigree, the Minion DHF Wide Trail 3C/EXO/TR 29" MTB Tire will give traction in almost any environment. Originally designed for DH, the Minion DHF's tread pattern has been around for years because it works. This Wide Trail version is designed for wheels with a 30 – 35mm inner rim diameter, allowing those with wider rims to benefit from the incredible grip offered by the DHF. Whether cornering or ripping down a straight, and regardless if you're rolling through mud, loose conditions, or hard pack, these tires will keep the bike under you. 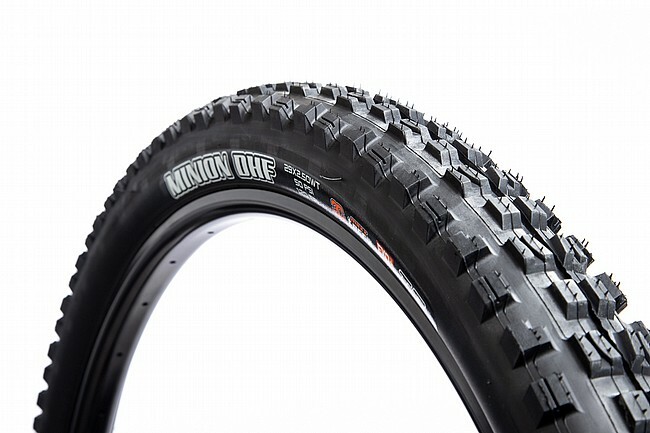 The Minion DHF Wide Trail 29" 3C/EXO/TR MTB Tire measures 29 x 2.5 inches (61-622 ISO). Also available in a 27.5" version. Black. 60 TPI. 1015 grams. Awesome front tire for my Pivot!! I bought this to replace my worn out front tire. Great price from biketiresdirect, mounted and set up tubeless perfectly. I ride rough nasty trails here in Phoenix, AZ. This tire gives excellent traction, its mostly loose on hardpack, jagged rocks, Cactus, & dry conditions, not a tire friendly environment! About 400 miles on it so far, no rips tears or holes!